A wealth of opportunities for committed students. We cover fields as diverse as automotive, chemicals, electronics, trade, cosmetics and pharmaceuticals, solar and wind power, or cement production. This range of industries shows that sensor technology from SICK can be found in many sectors of the global economy – and it is being further developed at an astonishing pace. And you can be part of it. And not just after you have graduated but a lot of earlier: as an intern during your thesis work, or as a working student. Gather valuable experience and extend you knowledge. Make contacts with other trainees and within the company that will be of use to you long into the future. You will benefit in many ways – including from excellent working and training conditions. 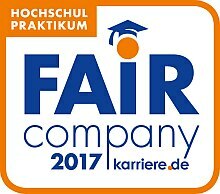 SICK has karriere.de's Fair Company Initiative seal of approval. We have undertaken to apply the agreed rules concerning fair working conditions for interns and first-time employees. Because we are convinced that your commitment deserves fair, all-round support right from the very beginning. Experience everyday professional life and discover opportunities. An internship at SICK AG or one of its subsidiaries is the perfect opportunity to put the knowledge you have acquired in your studies into practice in a real working environment. You will be closely involved in everyday business activities, will work in different project teams and find out about the day-to-day activities of an internationally active business. You can work with us during a preliminary internship or spend an entire half year as an intern or working student. With your bachelor's / master's thesis, you provide impetus for the development of our products or processes and, in return, benefit from our expertise and support. Choose one of our current topics or work with us to develop a topic of your own. Whatever you decide, experts from our specialist departments and a personal supervisor will be there to help you at the technical and methodological levels. As a working student, you combine the best of all worlds. You regular work for us gives you an income, while at the same time, you are able to apply what you have learned in the lecture theater in practice. What is more, our working students benefit from an extended period of activity. You work with us for a semester and during your vacation for approximately 10 up to a maximum of 20 hours per week. You agree your individual working hours flexibly in direct consultation with your team. You must be registered for the current semester before you can work for us a working student.